For the past 15 years, I’ve gigged between 150 to 200 times a year. I should clarify that I’ve actually been gigging for twice as long, but it was 15 years ago that I started playing venues where I had to bring my own equipment. Prior to that, I only played gigs where I could plug into a board, or more accurately, all the gigs I played just happened to have a board. But then I started getting gigs in other venues where I had to provide my own sound. I first started out with a Soundcraft GigRac 300 powered mixer that drove two passive Yamaha monitors. Combined with my pedals, guitar, mic and music stand, that was a couple of hundred pounds of gear that took up to a few trips to lug in, depending upon where I was playing. I played with this set up for several years. Then a few years ago, I discovered the Fishman SA220 SoloAmp PA that combined mixer and a 6-speaker array into a single unit that weighs only 25 pounds. Now I could do everything in a single trip! But being all about efficiency, I was still looking for ways to trim the weight from my rig. 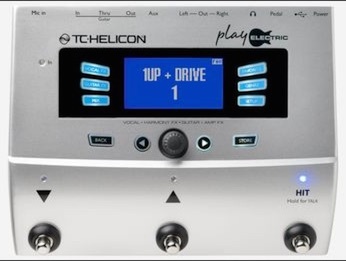 Enter the TC Helicon Play Electric. Before I moved to the excellent TC Helicon Harmony G XT, for years I played with the VoiceLive Play GTX, and though the GTX had on-board effects, I just didn’t like how they sounded, so I still ran the guitar signal into a few effects boxes. But all that changed when I started using the Play Electric. With the TonePrint models for chorus, reverb and delay built into the unit, I’ve had no need to lug my pedal board. You see, the most important thing for me when playing live acoustic through a board is to not get that flat, mid-rangy, and dead plugged-in acoustic guitar sound that seems to be so prevalent with plugged in acoustics. I’ve found that the way to avoid this is to use effects like chorus, reverb and a bit of delay to make the tone more rich and do some tone shaping. It takes away some of the natural tone of the sound, but it sounds a hell of a lot better than my guitar being directly plugged right into a board. But until recently, I could only achieve that by lugging around my own modulation effect pedals. The Play Electric’s effects models completely solve that issue, and along with the acoustic amp simulator that I’m using, there is just no need to lug my pedal board to a solo gig. Now, all I bring along is a bag of cords that I also can use for the Play Electric, and another bag to carry a couple of songbooks and my iPad, plus my SoloAmp if needed. That’s a serious reduction in lug weight and bulk. As far as the unit’s performance is concerned, I couldn’t be happier with the tone from both the vocals and guitar. Granted, I spent a few hours getting the tones for both vocals and guitar dialed-in, but I would’ve done that with any unit. The point though is that it was all worth it. At the restaurant that I play at two to three times a week, a challenge is volume. I need to be loud enough to be heard, but not so loud that it’s overpowering to the diners. The compression for both vocals and guitar performs quite nicely, and allows me to get my sound out in the restaurant without turning up the gain faders on the restaurant’s board. What I noticed is that my sound gets great distribution with the compression, but also, the sound is very clear, especially with the guitar. Harmony tracking, as expected, is awesome with the Play Electric, though the harmony voicing seems a bit clearer than with other units. That’s a good thing, but it also means that harmonies stand out more, and if I’m even slightly off, you can tell the difference. One thing that is actually kind of weird, and something that no one has figured out is harmonies when playing an F#m chord. I’m not sure why this is, but every unit I’ve ever played, be it the DigiTech VocalistLive I used to play or any of the TC Helicon units seem to act a bit quirky with the F#m chord; specifically with the Eagles’ song, “Peaceful Easy Feeling.” The transition from the A to the F#m always gives a really quirky harmony. Oh well, other than that, the harmonies are awesome. As I mentioned in my review of the unit, the only thing that hurts this unit is the short looping time. For most of the songs I play with a loop, it works just fine, but there are some songs where I need a bit more looping time, so it looks like I’ll have to use my BOSS RC-2 for the longer loops. It’s not a big deal, but it is mildly inconvenient. All-in-all though, for the sound Play Electric produces, it’s a winner in my book! Great post, really detail and make a point of your own, I like to read post like this, expecially report, Already bookmarked it. Keep writing on and thanks for sharing!! I was on the fence between the acoustic and electric. I play mostly acoustic but the electric does come into play. I think I am going to go with the voice live play electric.